It would take a pile of adjectives to adequately describe the music on this album. We could start with delightful or catchy, perhaps, but we should quickly add melodious, animated and danceable. Then there’s luminous, effervescent and sparkling, which all belong even if they’re pretty much synonyms. Potent fits. Candid too, and rootsy. Some “in” words: infectious, involving, intense. Vivacious, yes; rhythmic, definitely; beautiful, absolutely. This guitar-based, acoustic music, known as bachata, comes from rural Dominican Republic, therefore – no surprise – it is infused with that amazing, unquenchable Caribbean human spirit. 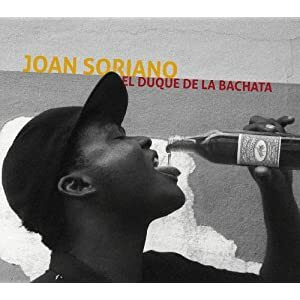 And on hearing Soriano’s assured take on the music, it’s clear why he has acquired the title “The Duke of Bachata”: he’s a natural at it, both in his singing and guitar-playing. The enchanting documentary film on the accompanying DVD illustrates that point perfectly; it shows how Soriano represents the younger generation of bachata musicians with all the enthusiasm and enhancements expected of the young, but as the film also demonstrates, there is no doubting his commitment to the essence of his art form. So I highly, highly recommend this wonderful music and its well-designed packaging. Accompanying the CD and DVD is a booklet with informative liner notes by Ned Sublette, whose expertise on Caribbean cultural matters I came to respect in reading one of his books. El Duque de la Bachata is a remarkable set, an undoubted and easy choice for my “top-ten” albums of the year. Joan Soriano on National Public Radio. Previous postCD Review: Dubblestandart, Marijuana Dreams Next postWin David Rodigan CD!